ADODERM represents the innovation and development of various dermatological products and surgical implants in the field of Aesthetic-Plastic Surgery and Dermatology. With more than 25 years of ongoing research and development, the team of Adoderm has introduced numerous and patented products to the market and has achieved a worldwide product distribution in more than 70 countries. With a long lasting professional responsability, the customers of Adoderm benefit from sophisticated and effective products and an optimal price quality ratio. The Varioderm product line is a new generation... of highly concentrated and cross-linked hyaluronic acid for various indications in the dermis and subcutis convincing with long-lasting clinical results Our objective is a long lasting solution to your face´s ageing process. 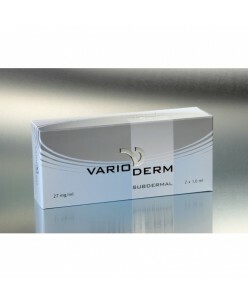 As such, we have developed the Varioderm prod.. 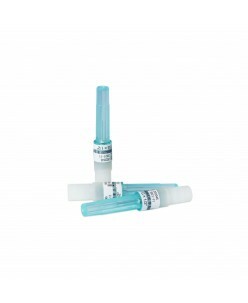 Concentration 6 mg / ml Cross-linked with DVS Injectability Needle size 30G with excellent visco-elastic features Packaging 2x 1,0 ml Indications Superficial to Medium wrinkles Glabella lines Peri-oral and -orbital lines .. 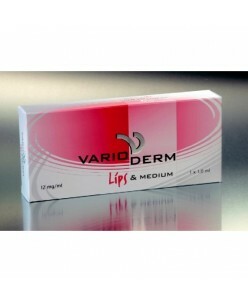 The Varioderm Lips & Medium is a new generation... cross-linked hyaluronic acid filler highest cross linking grade with BDDE without dilution for various indications around the lips and medium wrinkles Our objective is a long lasting solution to your face´s ageing process. This is why ADODERM GmbH has chos..
...is the natural solution derived from non-cross-linked hyaluronic acid of biosynthetic origin. It is used with the newly developed Mesolift procedure, where it is utilized highly concentrated in areas where it is needed the most: face, neck, decollete as well as the back of the hand. The Mesolift procedure is able to employ it.. 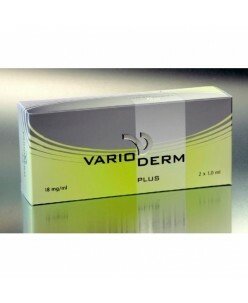 The Varioderm product line is a new generation... of highly concentrated and cross-linked hyaluronic acid for various indications in the dermis and subcutis convincing with long-lasting clinical results Our objective is a long lasting solution to your face´s ageing process. As such, we have developed the Vario..
Varioderm needle 27 G 13 mm.